This painting, painted by Aziz Anzabi shows how normal people are bewildered while living normally without realising that power and the government are affecting their lives in a negative way. 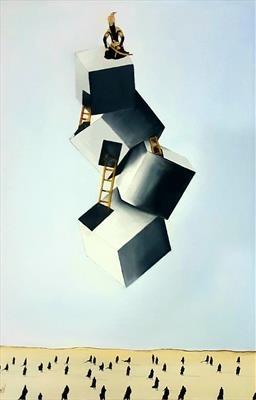 The ladders that are connected to each cube are a symbol of power, ironically there is no ladder to the first cube suggesting that the government is separated from the people and has a higher position so therefore lives a more fulfilling life. It also suggests that power causes separation between the people and could be the main reason for war. The fact that the people are walking around in a desert shows that the people are not aware of what is happening to them. While the people are wondering around lost, the king is comfortable setting at the top which also suggests that the king tries to provide a better life for himself rather than his people. To me this painting is meaningful because it shows that power could be a reason for war and separation between people and the people can never seek help from their king/ government because they have separated themselves from their people.